I am a scientist with thirteen years of post-PhD laboratory research experience. 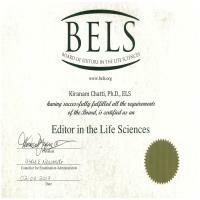 I am also a BELS-certified editor, and serve on the editorial board of the Elsevier Journal Heliyon. My main areas of work have been tyrosine kinase regulation and diversity in cancer, and using the zebrafish as a model organism. I have expertise in molecular biology, biochemistry, pharmacology and bioinformatics.